Creating a so-called blended family is always going to involve a few bumps along the road as you navigate finances, living arrangements and childcare. But one mother has been left fuming by her partner after he suggested that she should pay for his daughter to attend private school alongside her own two children. 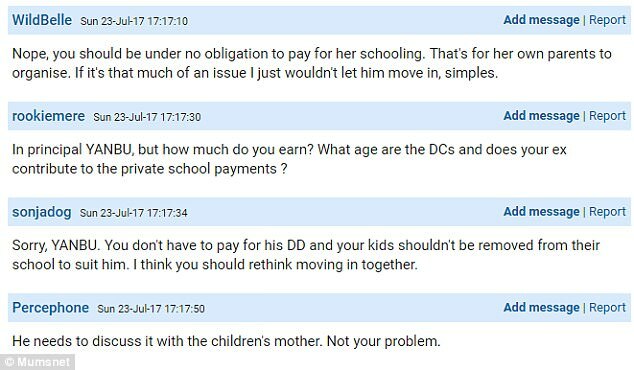 The woman took to Mumsnet to rant about the situation, explaining that she's due to move in with her partner who previously assured her his daughter would have no problem continuing at her state school, but is now demanding that the 'situation be fairer'. He responded by telling his daughter they would 'look into it', but as he only earns £16,000 a year he wouldn't be able to afford the fees and was essentially asking his partner to pay. Commenters told the mother not to move in with him let alone pay the fees and warned that he was treating her like a cash cow. But others insisted that all children should be treated equally if they're going to be a family and that their incomes are going to be joined once they move in together. And some said that the debate was an example of double standards and that if a man refused to pay, despite being the higher earner, there would be an outcry.